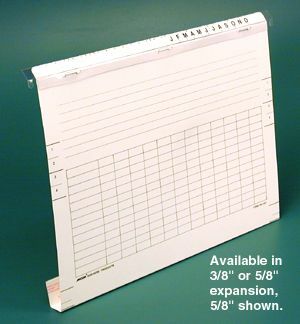 12" x 9" Add-on folder with hanger pre-attached, 3/8" expansion, for use with 50-0911, 50-0912 & 50-0940. 100 per package. Expand the capacity of your folders with the Ancom Add-On Folder. Constructed of 12 point coated stock, the add-on can be easily secured to any 12 in x 9 in pouch by its permanent adhesive strip. Sold separately for you to install. Options include adding pocket, heat-bonded fasteners and dividers to secure documents.